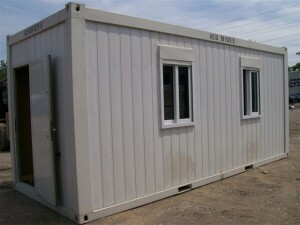 The most common request I get with containers is to modify them – add doors, windows, partitions, etc; followed closely by people who want to turn them into storm shelters or root cellars by burying them. Now, I have covered these issues in the past, but it never hurts to revisit the basics. Modifications. Containers are great building blocks. You can use them as is, or you can simply cut a few holes and add a few modifications and you can drastically change the purpose of a container. Extra doors and windows are the most common modifications, but some people get very fancy and will build homes out of them. We can help you with your modifications in two ways: 1) have your container provider modify them for you; or 2) purchase a kit so you can modify it yourself. Modification costs and options will vary depending where in the country you are located. In some locations you can get electric work installed, in others that has to be done after the purchase. 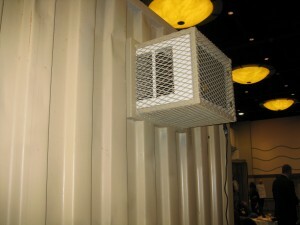 Kits are another great for adding doors, windows, AC/heat, skylights, partitions, etc. Specialty kits are available as well if you already have a feature you want added on, but just need a frame to install it. Storm shelters/root cellars. This is a very common use for containers. People either bury them completely in the ground or put them into a hill. There are pros and cons to either option. Not the least of which is if you have a hill handy! Some things to keep in mind when creating your storm shelter/root cellar is 1) to protect the container from the elements, 2) to protect the container structurally,3) to follow local zoning.